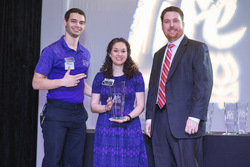 Collin Rutherford, left, graduate assistant of leadership and service at Stephen F. Austin State University, and Molly Moody, assistant director of student engagement at SFA, accept the Gulf Coast Regional Blood Center award for "College of the Year" from Kevin Shipley, director of donor recruitment, at the Celebration of Life luncheon held recently in Houston. According to blood center officials, since 2003, more than 17,000 units of blood have been collected as a result of SFA-hosted drives, saving 50,610 lives. In the days following Hurricane Harvey, a drive on the SFA campus resulted in the donation of more than 150 units of blood. NACOGDOCHES, Texas - The Gulf Coast Regional Blood Center named Stephen F. Austin State University "College of the Year" in recognition of the university's role in increasing blood donations. The award was presented at the center's recent Celebration of Life ceremony in Houston. Colleges and universities within the blood center's 26 partner counties were considered for the "College of the Year" title. "SFA is unquestionably a terrific asset to this whole region," said James Slack of Lufkin, advisory board chairman of The Blood Center East Texas and a member of the Gulf Coast Regional Blood Center board of trustees. "It makes all of us proud as we see new leaders being prepared, especially when they show hearts for service and concern for their fellow man." SFA has partnered with the blood center for 15 years, hosting a total of 700 blood drives since 2003. More than 17,000 units of blood have been collected as a result of this work, saving 50,610 lives, according to Brian Gannon, president and CEO of The Gulf Coast Regional Blood Center. The Gulf Coast center must maintain an adequate supply of blood and blood components to meet the needs of 170 hospitals and health care institutions in the Texas Gulf Coast, Brazos Valley and East Texas regions, according to Cameron Palmer, media and promotions coordinator for the Gulf Coast Regional Blood Center. "The Gulf Coast Regional Blood Center must collect 1,000 components a day to replenish the supplies needed," Palmer said. "Every donation can help save up to three lives." Palmer said schools and universities make up about 40 percent of all the donations. "We like to target this group of individuals to continue to educate them on the importance of donating," Palmer said. According to center officials, many people do not donate blood due to fear of the procedure. Jacob Samford, a sophomore music education major from Tenaha, decided to donate blood and overcame his fear. "I love that something that I do right now by just taking a little time out of my day can potentially save a life in the future," Samford said. The Blood Center also has volunteer options for those who cannot donate blood due to health issues. "Gulf Coast Regional Blood Center has a great program with several volunteer opportunities," Palmer said. "You also can host your own blood drive to educate and encourage people in the community to donate." For more information about student activities at SFA, visit www.sfasu.edu/life-at-sfa.